Since I hit the 50s, I have been exploring more into healthy eating. I have heard a lot about the goodness of Brown Rice ( 糙米 ), and have been thinking how to make it tasty so that my family can accept the taste. Brown Rice is a highly nutritious food, and according to Harvard T. H. Chan School of Public Health ( HSPH ), the fiber in brown rice helps lower cholesterol, moves waste through the digestive tract, promotes fullness, and may help prevent the formation of blood clots. Gotta admit it is an acquired taste and honestly, I have not tried any appetizing brown rice until I visited Crystal Jade recently. It was brilliant of them to add the popular canned Fried Dace Fish into the rice, and I was determined to replicate their yummy dish. The moment I told my son I would be cooking brown rice for dinner one day, the first response I got was, “Yucks!” Well, I can truly connect cause I have never liked eating brown rice either, but this has changed since my last visit to the Chinese restaurant. 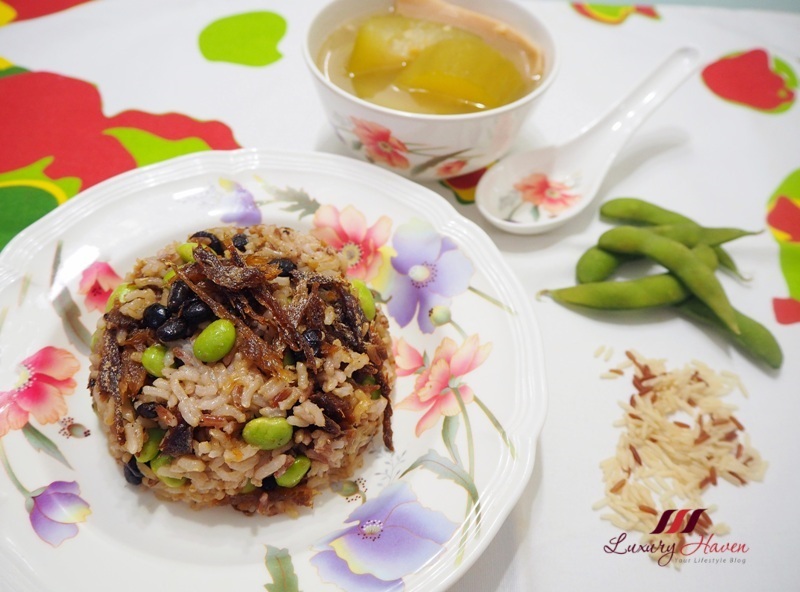 In this recipe, I am using the Natural Harvest Fresh Rice Organic Thai Mixed Fragrant Brown Rice ( 新鲜米有机香糙米 ), and Mili Fried Dace Fish with Salted Black Beans ( 豆豉鯪魚 ). I also did a bit of tweak to the original dish that was served in the restaurant by adding Edamame ( 日本枝豆 ), a popular Japanese young soy bean snack which is low in calories, contains no cholesterol, and an excellent source of protein, iron, and calcium. I am happy to have introduced the one-pot dish to my family, and changed their perspective of the yucky food. I have paired my healthy brown rice with a Delicious Hairy Gourd Soup with Dried Conch Slices ( 節瓜响螺片汤 ). Both hubby and son took an immediate liking to the Brown Rice with Fried Dace and Edamame ( 美味豆豉鯪魚糙米饭 ) that I had prepared, and I am so glad that they even emptied the entire pot! I hope you will like this recipe as much as we do, so let’s get cooking! Follow instructions on Edamame package to prepare the soy beans. My family enjoys eating this healthy snack, hence I usually make about 2-3 packets at one go, then store in an air-tight container and refrigerate after extracting all the beans. Rinse rice, add water and salt. Cook for about 15 – 20 minutes, then throw in edamame. Remove bones from canned fish, and peel into bite-size pieces. When rice is almost cooked, add in dace fish and black beans. Mix well. Cover and cook for another 5 minutes or so. 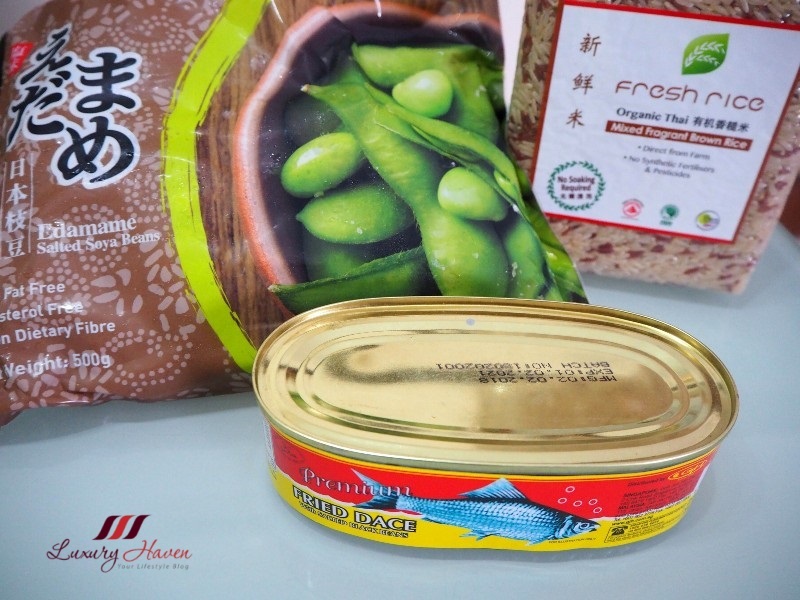 Pair your Brown Rice with Fried Dace and Edamame ( 美味豆豉鯪魚糙米饭 ) with your favourite soup! Have you participated in our latest Giveaway Open to All Worldwide? 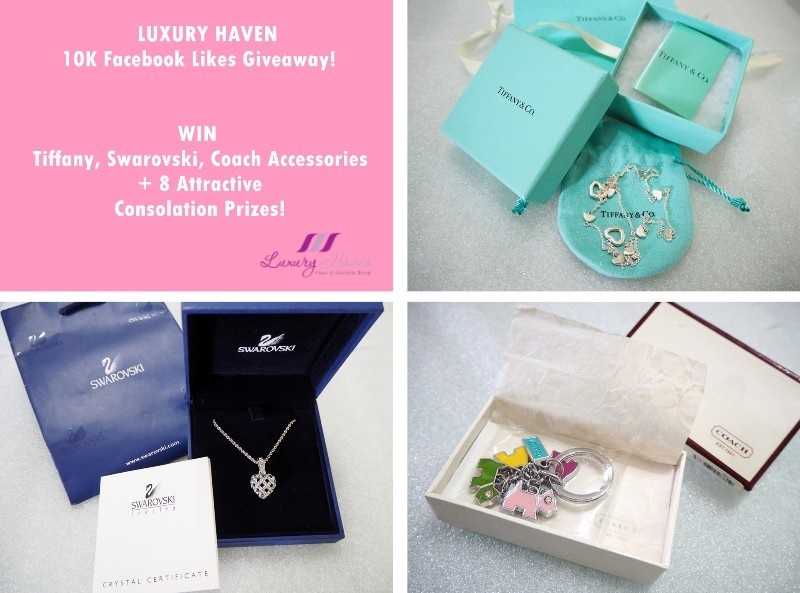 To celebrate the milestone of Luxury Haven crossing the 10K Facebook Likes, we are rewarding our fans with Tiffany, Swarovski, Coach Accessories, and more! Submit Your Entries now, and all the best to your entries! Shirley, that is so delicious! I use to eat alot of this canned Dace fish with black beans when i was a young child... have missed eating this for a long time already...with this recipe, perhaps i could pick up again. Thanks for sharing this awesome recipe... ps: didn't know that crystal jade have this dish.. shall try one of this day. Seems a delicious and healty recipe! I love edamame. Interesting recipe but healthy cooking and eating, Shirley. I should start eating healthy too. I'm a huge fan of brown rice. This recipe looks super good. Brown rice and edamame are healthy food and tasty too. Add in fried dace, the whole dish is more flavourful! I much prefer brown rice over white.